In the past fourteen days the Health Insurance Marketplace has been up and running there have been a lot of glitches. 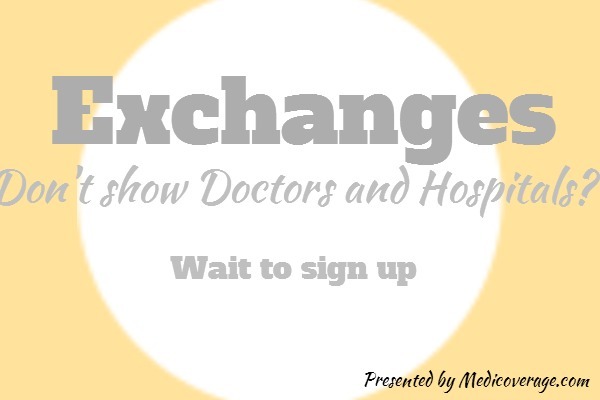 One of the big problems is many of the Exchange do not include networks of doctors and hospitals. How does someone choose a health insurance plan without all the details? We say, wait. Let us explain. Sites giving “busy” messages when consumers try to apply for the newAffordable Care Act Bronze, Silver, Gold, and Platinum plans. Premium subsidies and cost-sharing subsidies not being totaled in until November in some states. Doctors and hospitals not included in lists for consumers in some states. The doctor and hospital finder on Covered California’s website went up a week after enrollment began, and was almost immediately taken down. We know that CA residents will find a smaller network, however consumers were finding that hospitals were not available within 100 miles, because Covered Ca had not updated all the networks not because they wouldn’t be available, according to San Jose Mercury News. Officials are concerned that seniors might become targets of ObamaCare scammers. So we are stressing to our clients: seniors who are on Medicare do not sign up for ACA plans. If you are over 65 and do not qualify you can sign up for the new ACA plans. This message is extremely important as there is a lot of confusion with the federal and state sites not fully up-to-date. Wait it out. You can enroll up till December 15, 2013 for a plan that begins on January 1st. There is no reason to rush when you don’t have all the facts in front of you. However, if you have any questions please call 800-930-7956 or contact Medicoverage. Agents are available to help you understand your options with the new plans. UPDATE 11/27/13: there is an easy way to fill out your Affordable Care Act application. First you go to Healthapplication.com and fill out the application send it in, and an agent will contact you about plans in your area, answer questions about doctors and hospitals, and tell you if you qualify for subsidies. I own a couple of small rental income properties. When figuring M A G I one would use the typical Schedule E format. In other words M A G I is computed after mortgage interest and other expenses, correct? Good question! A quick answer is that you would deduct business expenses and add in income from your rental properties. To learn about this check out our chart of what’s included/deducted for MAGI and the Affordable Care Act. But as always, we suggest to speak with your tax professional for specific tax questions.